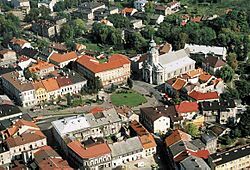 Wadowice [vadɔˈvʲit​͡sɛ] (German: Frauenstadt – Wadowitz) is a town in Poland in Lesser Poland Voivodeship in the mountainous range known as Zakopane region, 50 kilometres (31 miles) southeast of Krakow - (former Polish capital). Wadowice Facts for Kids. Kiddle Encyclopedia.